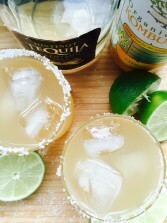 1) For each cocktail, mix 1/2 cup citrus kombucha + 2 tablespoons tequila + 2 tablespoons fresh lime juice. 2) Serve in a salted rim glass over ice cubes. What is citrus kombucha and where would I find it? I, finally found that has super food recipes, I would like to try them for myself and husband by eating healthy and enjoy the recipes together. It’s very hard when you can’t have meat because of gout. I enjoy having meat my but body can’t take any more. Maybe theses will help me.